We have started to catch Spotted Wing Drosophila adults in low numbers. While these numbers are very low, they do indicate a presence in our production areas. 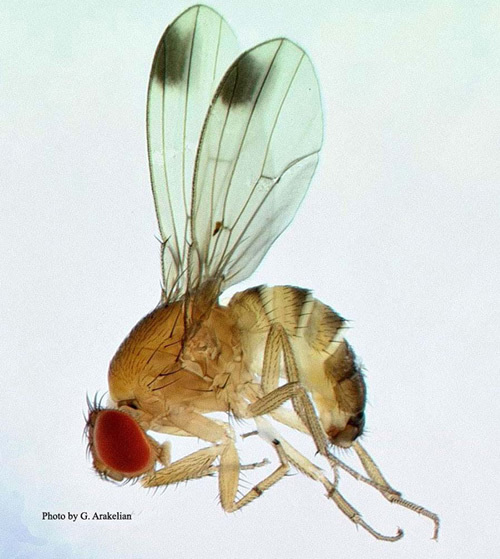 Spotted Wing Drosophila (SWD) is an insect pest of fruit that has spread from California in the past 3-4 years to several states across the US. The greatest economic impact is expected to be in blueberry, peach, cherry, strawberry, raspberry, and blackberry crops because soft-fleshed fruit are easier for the flies to lay eggs in and for larvae to develop. This pest has also been reared out of other fruit crops, and from berries of wild plants. SWD flies are small, around 2.5-3 mm in length, with light brown bodies and darker brown bands on the abdomen. Adults have characteristic bright red eyes, and the males have a prominent dark spot on each wing that can be easily seen with a hand lens. Females are less distinctive, but their serrated ovipositor is a distinguishing feature. This fly is native to Asia and is also reported in Hawaii. SWD is not a true fruit fly like blueberry maggot or cherry fruit fly. 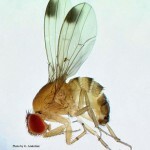 It is a vinegar fly similar to the other small flies that infest ripe fruit during the summer, but with some important differences. This species attacks intact fruit, using the saw-like ovipositor to lay eggs under the skin. Also, female flies can lay hundreds of eggs and this species develops quickly, completing a life cycle in about three weeks during our typical summer temperatures, allowing buildup of the populations through the season.